Last month, I posted about losing our sweet cat, Jack, to cancer, just weeks after we’d adopted a new kitty named Sherlock to be his pal. Suffice to say, it was a sad and confusing time for all members of our family, both human and animal. But today’s post is a happier one. Because the good news is that Sherlock and our dog, Spencer, are bonding in ways we never thought possible. You see, despite the fact that Spencer has lived with cats since he moved into our home two years ago and has always been respectful of their space, he never interacted much with them. Certain areas of the house were feline and certain ones were canine. But Sherlock didn’t care for that arrangement. 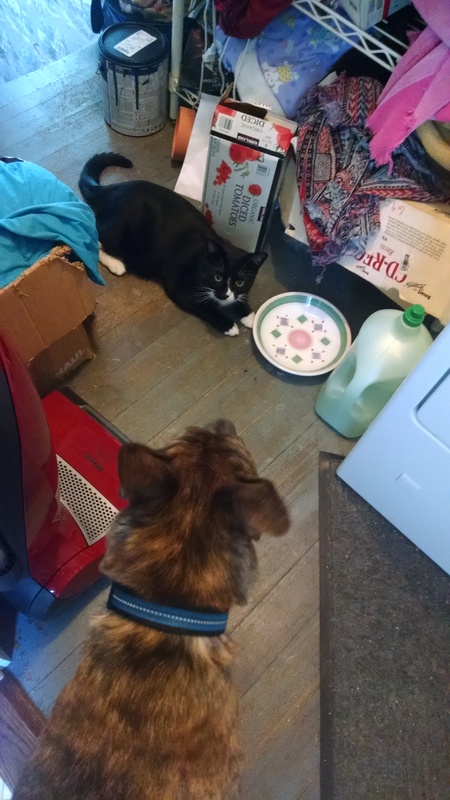 From the moment we introduced him to Spencer, he seemed to want the freedom to roam anywhere he liked, and he was constantly trying to play with (or at least antagonize) the poor dog. Honestly, it was hard to tell what was going on in his cat brain. He’d sit on a table or countertop, and when Spencer walked over to give him a sniff, Sherlock would strike out quite viciously with his claws. Then Spencer—who’s a formidable hunter outdoors—would run away. For a while, we were afraid Spencer would turn on Sherlock, so we humans kept a close eye on the two of them, and made sure to separate them whenever we left the house. But as the days passed, it became increasingly evident that the dog didn’t want to hurt the cat. Current dog psychology informs us that dogs are pack animals, and apparently, Spencer has begun to view Sherlock as a member of the pack. Yes, he’ll chase the little fellow, but whenever Sherlock jumps onto the kitchen table, Spencer “gives up.” He’ll walk away “defeated,” but in fact, he and I both know that he can hop up on that table in a heartbeat if he wants to. I’ve caught him up there plenty of times, searching for crumbs or whatever tidbits we humans have left behind. Also encouraging is the way the animals have recently begun greeting each other with nose touches. 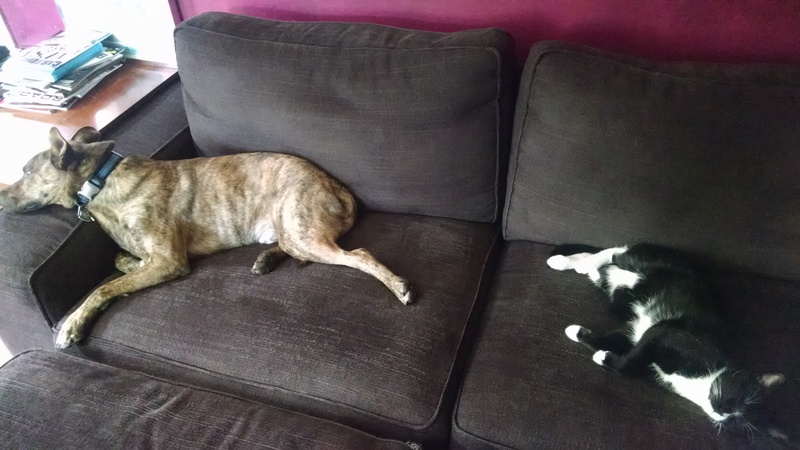 And they’ve started sleeping together on the couch like a couple of people who’ve been married for a while (sharing a bed, but facing opposite directions). It was a good lesson for us (make sure to seal those bags carefully, and keep the pantry door closed!) but we also couldn’t help laughing a bit about how the cat had helped the dog with his ongoing quest for treats. Then, just this morning, I heard some noise out in our back hallway—where we keep random stuff—and was surprised to discover that the cat had clawed a hole in a bag of dog food, and both animals were enjoying the kibble that had fallen to the floor. They weren’t squabbling over the food either. They were just snacking peacefully together; one piece of kibble for you, one for me. Again, I cleaned up the mess with some annoyance, but more amusement. I guess it’s time to find a new storage spot for the dog food. But I’m proud of these crazy creatures. 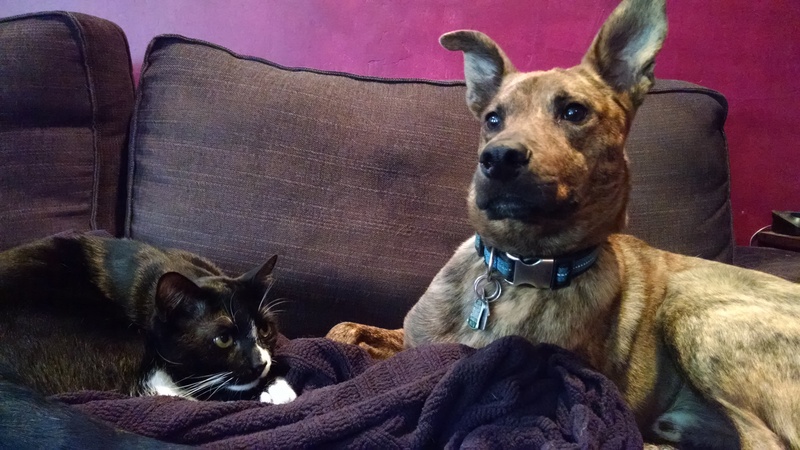 Here they are—a rescue dog who spent his formative months wandering the woods of South Carolina, and a cat who was recently surrendered to an animal hospital because his owner couldn’t care for him—learning to trust each other and even share food. It may sound corny, but it gives me faith in humanity. After all, if two animals with diverse and difficult histories can manage to coexist in peace, surely people can do so as well. This entry was posted in animals, cats, dogs, life and tagged animals, cats, cats and dogs getting along, dogs, family life, friends, life, pets. Bookmark the permalink. What a sweet story! My husband would love to get a dog but we have no idea how Pretty Kitty – who’s a bit peevish – will react! Thanks, Jan! Have you considered taking care of a friend’s dog while they’re away as sort of a test run? Back when we had our other two cats, we did that, and it helped us realize that those cats wouldn’t a.) be miserable/terrified with a dog around or b.) terrorize the dog. Of course, it’s good to have a backup plan, so that if the situation isn’t great, you can send the dog somewhere else. Best of luck if you try it! Thank you, Jacqueline! I still have hope for us humans. I read this post yesterday and I’m still thinking about it today. I just love that your two rescue animals are colluding to get the good stuff! Thanks, Sarah! How are your dog and cat doing together these days? Well that sounds like progress, Sarah! I hope it doesn’t take two more years–and bet it won’t if they’re already hanging out on the same bed.